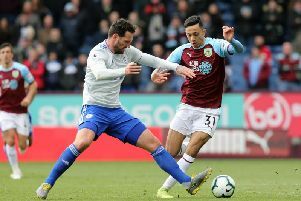 David Jones feels the experience of Burnley’s promotion push last season will serve them well as they look to avoid the drop. The Clarets take on Crystal Palace at Turf Moor tomorrow, having climbed out of the bottom three with victory over QPR last Saturday. Burnley are on the same points as the Eagles, and after a season where they have been underdogs in virtually every game, the Clarets go in as favourites. Jones said: “Last season we were favourites in a lot of games and we managed to perform under pressure at vital times. I think that’s the key thing. “The mentality of this squad is very strong and I feel that we are going to need to be strong again against Palace. “Last week against QPR there was a certain level of expectation, when we were at home, to win the game. He added: “There’s more pressure with bigger games but I’d back us in these type of games to be able embrace them. “I think the kind of mentality that has been bred at the club means we will be ready and the mentality will be right for those kinds of games so I don’t fear for us going into big games as the season comes to a close. “We are not dealing with it as individuals. The mentality of the group is ‘we’re going hard, let’s see if you can cope with what we throw at you’. Asked how important that mentality will be, Jones insisted: “Very important. There is a cluster of teams there and there isn’t a lot between them so it will all come down to the mentality and if you can perform under pressure.